Its been almost twelve years now since we left England to come and live on the island of Crete Greece and have moved house twice before settling here in a small village just ten minutes from the town of Agios Nikolaos. 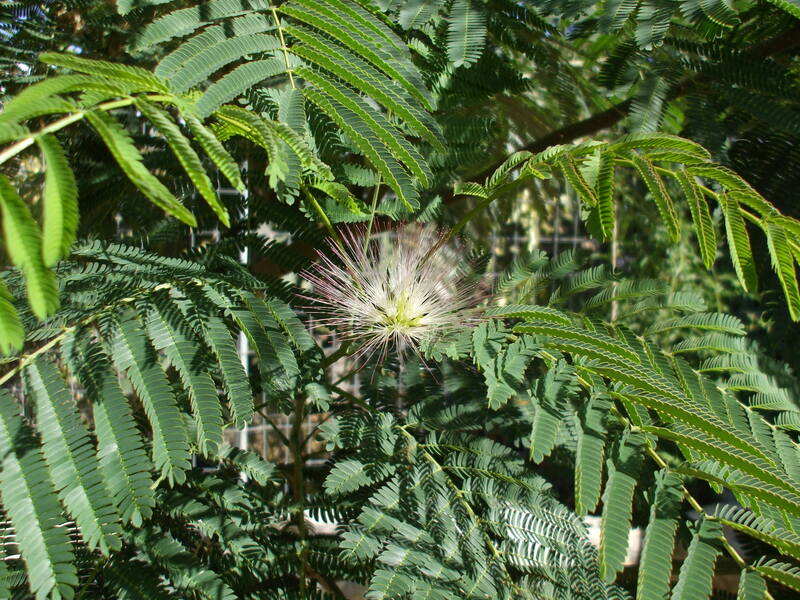 We have a garden where we planted two Acacia (albizia) trees which have now grown so tall to give us plenty of shade as the branches spread out like an umbrella, plus the lovely pink and white flowers have a beautiful fragrance during the evening. There doesn’t seem to be many birds here other than sparrows and pigeons.Swifts and swallows arrive during the migration period. However, low and behold one morning I heard the blackbird merrily singing his little head off, he was perched on an electricity pole nearby. Later another blackbird appeared, then we discovered the nest in our Acacia tree. The outcome was we could see six eggs in the nest where we could see from the tops of the tree from our balcony. Needless to say two eggs hatched and the babies were on the floor, I guess mother kicked them out of the nest. Here was me thinking we were going to have the beautiful sound of the blackbird but haven’t heard any more since. I am hoping they return next year. All this prompted me to encourage my partner John to build an aviary in the garden (He has bred birds many times before. 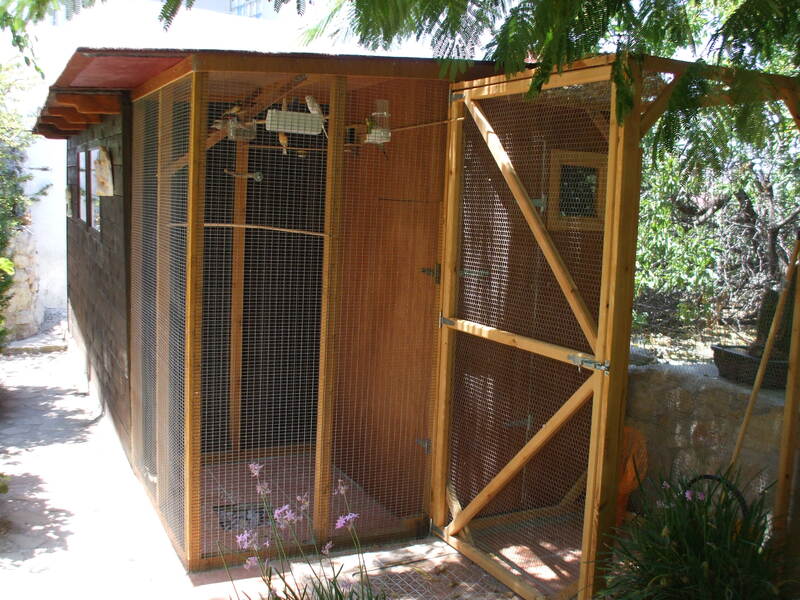 There is a previous post about this so I need not go into all the details of how to build an aviary. 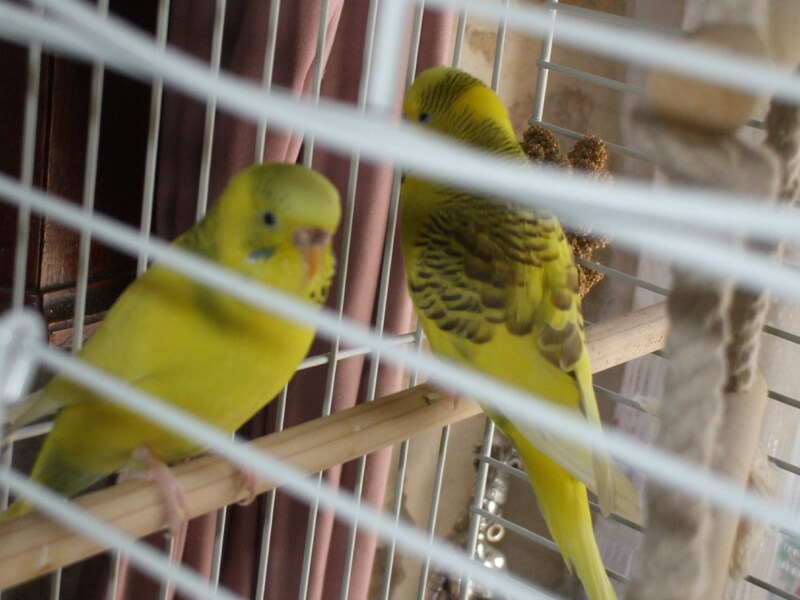 For as long as I can remember I have always kept a bird in the house, my choice usually has been a cockatiel so once we settled in Crete I bought a Budgerigar, his name was Jamie and I taught him to talk. He survived for seven years and I said I won’t have another one. Famous last words. 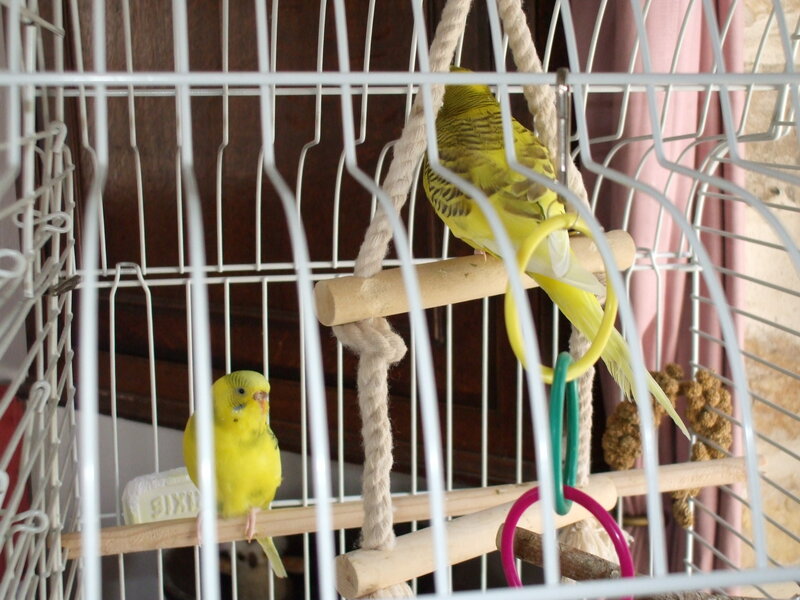 Recently while out shopping I was tempted to peep into one of the the pet shops in the town where I bought my previous budgerigar, and there were two I could not resist because they were more like love birds staying together and following each other around one did not move without the other. I only really wanted one but could not possibly separate them. This meant I had to buy a big cage so they had plenty of room to stretch their wings. Their color is yellow with black markings, they are so comical, they chat away to each other bobbing their little heads up and down, play with their toys quite friendly with each other. This of course was my way of encouraging John to build the aviary. This he has just completed and we now have Zebra finches, Budgerigars and Canaries. At last the different sounds of birds to listen to while sitting in our garden. Sammy and Dixie My house birds. They are let out of the cage to fly around the house. 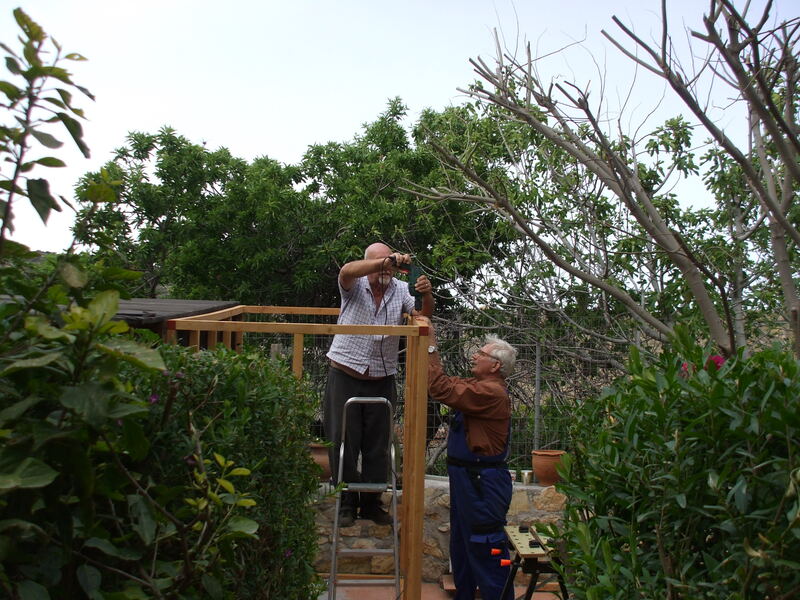 Beginning of the Aviary. That’s John in the Overalls. Leaves not yet on the trees. 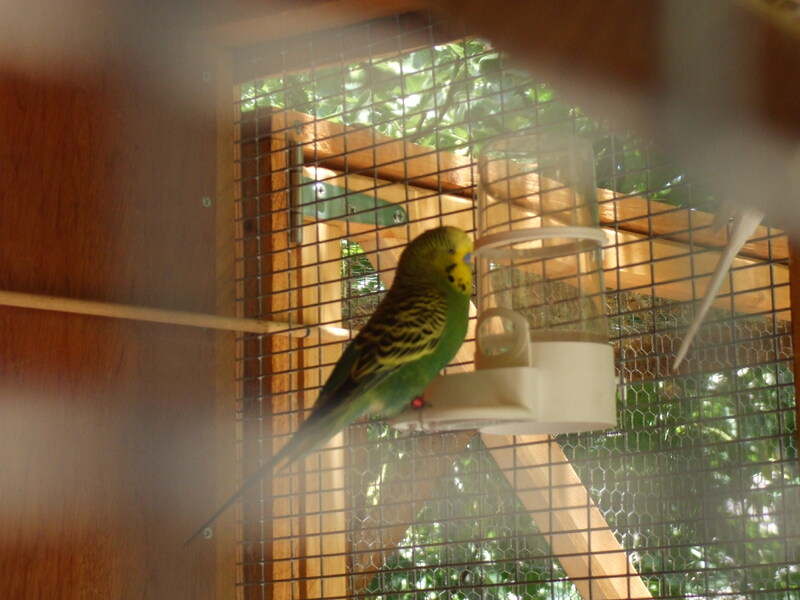 One of the aviary birds. He’s a proud one…. Note how the trees now shade the aviary. Thanks Dora. Yes its very pleasant and relaxing.